Of all vegetables, peas are perhaps the best reason for growing one’s own: it is impossible to buy peas that taste anything like those that are picked straight from the garden. However, the difficulty is that if you want to grow a succession of crops to give you peas throughout the summer, you will have to devote quite a large area to them. This is not the problem it once was, however, because the majority of peas are now much shorter, and even if you have space to grow only a few in a large bucket, the effort is worth it for the taste alone. Peas are one of the oldest vegetables cultivated by man. They have been found in settlements from the Late Stone Age onwards – that is, nearly 8000 years ago. One of the advantages of peas has always been that not only can they be eaten fresh, either raw or cooked, but they can also be dried and stored for later use. The Romans, in particular, spread the cultivation of peas, probably introducing them to Britain. Surprisingly, they seem to have vanished from cultivation in Britain and were reintroduced from mainland Europe only in the 16th century. The wild pea, from which the cultivated form was developed, is still found growing in Turkey, and it is thought that this is where they probably originated, especially as some of the earliest archaeological finds come from that area. Until about 50 years ago, peas grew to 1.8m or more and had to be supported with pea-sticks. Modern varieties are generally quite short, however, and can be easily supported with low wire netting or even a couple of strings stretched horizon­tally. Some varieties need no support at all. Although the peas themselves are generally regarded as the “vegetable”, from surprisingly early – certainly before the end of the 16th century in Britain – there have been forms with edible pods. There are various types of pea. First earlies are the earliest of the year. Those that are overwin­tered have smooth skins, but there are less hardy varieties, which are planted in early spring, and these have wrinkled skins. Although they are less hardy, they taste sweeter. Second earlies and maincrop all have wrinkled skins. Mangetout (snow) peas, also known as sugar peas, can be eaten whole when the peas are still immature. Snap peas also have edible pods but can be eaten when they are more mature. Asparagus peas have winged pods and an asparagus-like taste. Petit pois are small, sweet-tasting peas. Peas like an open, sunny site. The soil should be Fertile, with manure or compost incorpor­ated during the previous autumn. First earlies can be sown in late autumn and then overwintered; remember to cover the plants with cloches in colder areas. Alternatively, they can be sown in the late winter or early spring. They can also he grown tinder cloches if necessary. 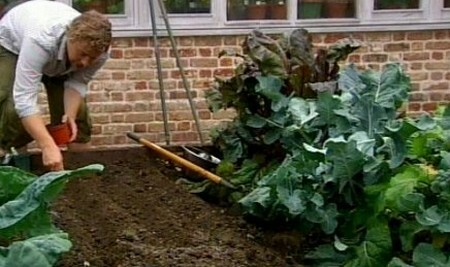 Crops can then be sown at intervals until the early summer. The easiest way to sow peas is to pull out a flat-bottomed trench with a hoe, about 15—20cm/6—8in wide and 5cm/2in deep. The peas are then sown in pairs, one on each side of the trench with the seeds at 5cm/2in intervals. Alternatively, they can be sown in a single drill at the same intervals. The distance between rows varies between 60-90cm (2—3ft), depending on the height of the peas. Add supports when the peas reach 5-8cm/2-3in high and the tendrils start to form. Use plastic pea netting, which is sold specially for the purpose, wire netting or pea-sticks. Once the flowers start to appear, keep the peas watered during dry weather. Pick the pods as soon as the peas have swollen and are large enough to eat. 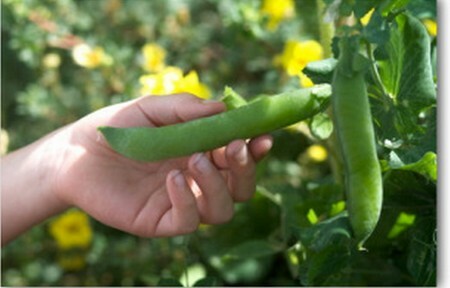 Mangetout (snow) peas and similar types should be picked before the pods get tough. Keep picking the peas as they mature. The peas of main modern varieties, which have been created for agricultural needs, mature at the same time, and this can be a problem for the gardener. Peas are best picked straight from the plant, although they can be frozen, which is one way of coping with a glut so that they are available through the whole year. Although it is not common now, they can also be kept by drying. Unfortunately, peas are prone to quite a number of pests and diseases. At an early stage both mice and birds can eat the seed. Birds will also strip the emerging seedlings, and it may be necessary to protect them with wire netting. Aphids and pea thrips can also be a problem. Mildew is something that affects crops most years, especially later in the season. It can normally be ignored, but you may prefer to use varieties that are less prone to mildew.